Small moments of detail such as these is what makes City Lights Theater Company’s production of the classic Ibsen piece a wonderful one, a visceral flesh-ripping examination of a narcissistic soul whose legendary boredom ruins lives with reckless abandon. Smartly directed by Virginia Drake, this Hedda haunts and fascinates, moving briskly through space, making the running time feel a lot shorter than it actually is. It is now time for the lovely Hedda Gabler (A passionate performance by Hayley Galbraith) to get started with the adult portion of her life, marrying the aspiring, yet underwhelming, academic George Tesman (an energetic Robert Sean Campbell). The marriage is certainly doomed to fail from the beginning, as evidenced by a rotten honeymoon which might as well have been called a research retreat for George’s academia. As Hedda reveals her utter boredom to Judge Brack (Steve Lambert), she begins to feel the walls of her banal future close in on her. There’s much more excitement with true scholar and recovering alcoholic Eilert Loevborg (a dark turn by Paul Henry), who is now in a relationship with his co-writer and Hedda’s school friend Thea Elvsted (Roneet Aliza Rahamim). Subtle glances indicate that there certainly was a relationship between Eilert and Hedda. And yet, much like in Federica Garcia Lorca’s “Blood Wedding,” there is safety and security in choosing the loyal dullard. But the desires of the heart cannot be turned off, and the yearning for the thrill of her youth serves Hedda in a very bad way. Virginia Drake, who also directed a stellar production of “August: Osage County” for City Lights, has probably never met a three-hour play she didn’t like. Certainly, at two hours and forty minutes, this play just about qualifies in that category. What is so strong about Drake’s direction is her keen understanding of pace. She moves the action frenetically at the end of the eerie and powerful act two, and gently hits all the right notes when Hedda and Eilert discuss his inevitable fate just a few minutes earlier. The arcs of each character were mostly handled with sharpness and depth from the ensemble cast. While Campbell maybe delved a mite too much into the arena of buffoonery in his portrayal, his strength was exploring his academic insecurities, a man whose only reverie of getting a coveted professorship was the hope that no one else was interested in the job. His absolute disconnection from Hedda is beyond surreal, never connecting with the fact that she’s just not that into him, which further pushes him to a level of hackneyed wannabe. Henry brought forth a character shrouded in mystery. There was nothing clichéd in his portrayal of Loveborg, and his deep yearning for a simple conversation with Hedda Gabler, and not Hedda Tesman, was full of intrigue. One of the most powerful scenes in the entire play was his submission from scholarship, and while he fought to accept this reality, Rahamim’s Thea worked non-stop to bring him back from the depths of misery. Certainly, this particular piece rests upon the strength of its title character, and to this end, Galbraith delivered in spades. What she does so well is create powerful subtleties – the gentle tapping of fingernails on a wall, darting of the eyes, suffocating breaths, a sly smile. In this role, Galbraith boasts sensational Meisnerian senses, an explosive listener who organically builds a character chock-full of narcissism and Lady Macbeth-like tendencies. Setting the play in 1937 opened up some fresh possibilities, namely the use of confounding composer John Cage and his esoteric compositions. The show’s usage of the Cage recordings of prepared piano, which creates dissonance by altering a piano’s timbre with various objects, lent itself well to experiencing Hedda’s mind. And while there were moments where different light cues might have worked a bit too hard to create blatant metaphoric moments, Cage’s uniquely strange technique certainly pushed the play in a new and mysterious direction. 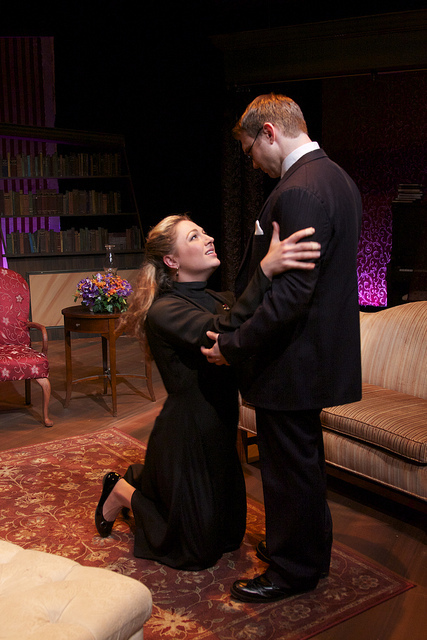 “Hedda Gabler” is one of the most phenomenal and intriguing anti-heroines in all of theatre history. There is no end to our fascination with Hedda, as well as other anti-heroines such as Medea, Lady Macbeth and Abigail Williams. What is so amazing is that these women live their lives as if they absolutely have no choice but to act on the darkest of impulses. And if a metaphoric baby must be burned and destroyed in the process, so be it. The word: Drake directs a stellar ensemble cast who do a bang-up job interpreting Ibsen’s realism style.